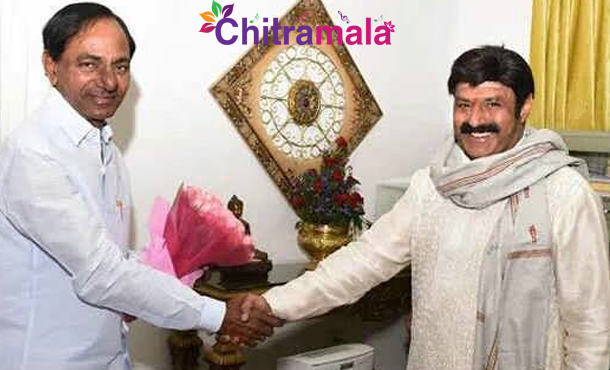 Tollywood actor, Hindupur MLA and TDP Supreme Chandrababu Naidu’s brother-in-law Balakrishna Nandamuri has today met Telangana chief minister K Chandrasekhar Rao in Hyderabad, and the duo had a long chat over various issues. Balayya has reportedly shared the services conducted under Basavatarakam Cancer Hospital under his administration. The Hindupur MLA has asked permission of TRS govt to regulate the norms of the buildings being built in the premises of the Cancer Hospital. He also asked the CM to increase the night-shelters for the relatives of the patients, for which KCR reacted positively. On the occasion, Balayya has reportedly invited the CM to watch his recent released film ‘Dictator’. When the CM enquired the actor about his 100th flick, Balayya replied that the film will be a sequel to his 90s blockbuster “Aditya 369”. Titled ‘Aditya 999’, it will be directed by Singeetham Sreenivasa Rao and will mark the debut of his son Mokshagna.